I’ve been reading Richard Thomas’s columns on Litreactor for years, and this is my first outing with anything fictional he’s written. One other member one described RIchard Thomas as ‘a freakin’ cool guy’ in an email to me. I don’t know Richard myself; I’ve only traded a forum post with him, to ask him when this book would be out and if I could get a Nook edition, but I can tell you one thing: he’s written a freakin’ cool book. Read Disintegration if you dare: it’s up there with the most bloodthirsty reads I’ve had and it will not inspire you to be happy. It will, however, remind that that even at the worst of times your life is probably fine. It’s also my second five star review of the year. Disintegration is one of those rare books that after twenty pages I decided I really didn’t like, only to go back for a second go and end up reading the rest in two sittings. Was my return to it a case of ‘I don’t like it but I admire it?’ Possibly. 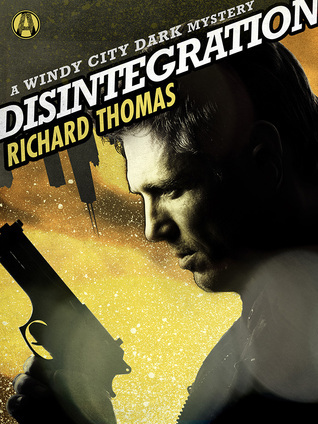 Thomas’s writing style is enviable to say the least: every paragraph feels polished, the ‘camera’ is always so concisely focused on what should inflict maximum impact on the reader, and the economy is striking: fast paced action and montage from scene to scene while giving plenty of time for reflection. Disintegration’s cover labels it ‘A Windy City Mystery,’ but for a while there didn’t appear to be much that was mysterious about it. I came to consider it an unconventional mystery in that the narrator often shows very little urge to solve anything, or even see there’s anything odd at work other than something feeling ‘wrong’ about his life. A lot of the page turning quality of Thomas’s writing was in the high intensity action, and the horror film shtick of rooting for the killer because sometimes the victims have it coming, not in the mystery, or in the ‘I have to know the truth even if I read all night to get it’ element I recently gave Hugh Howey five stars for. Disintegration is a new kind of mystery fiction for me. Even when revelations do happen, the real mystery for me in Disintegration lies in the questions that remain largely unanswered or open to interpretation. What I never found out left me thinking back through the book, not perhaps to the extend where I’d do a re-read looking for clues, but the kind that made me re-consider me love of complete closure in fiction. Any writer who can do that’s earned their five stars. Disintegration also has a brilliant ending. Happy or sad, I’m not going to say. Just that if this book’s your sort of thing and it leaves you disappointed, I’ll be surprised.